Matthew B. Platt, the assistant professor whose spring 2012 course Government 1310: “Introduction to Congress” was at the center of what is believed to be the largest cheating case in Harvard’s history, has not been promoted to associate professor after a routine tenure-track review, a senior member of the Government Department confirmed Tuesday. Platt, whose scholarship concerns racial issues surrounding political agenda setting, will remain in the department until the end of the academic year when his current appointment expires, according to the source. Typically, assistant professors who are not offered promotion are given a year or more to search for a position outside of the Harvard tenure track before being forced to leave the University, in accordance with the normal procedures of the tenure track. The source, who, like all tenured members of a given department, is involved in internal reviews of junior faculty as they seek promotion, requested anonymity due to the confidential nature of personnel decisions. It is unclear whether the decision to remove Platt from the tenure track is connected to his involvement in the Government 1310 case, in which about 125 undergraduates were investigated and dozens punished for allegations of cheating on Platt’s take-home final exam. Tenure-track reviews are typically based on a candidate’s scholarly work and teaching ability, with the former receiving slightly more weight in decision-making. The New York Times first reported that Platt was not given a promotion on Monday. Platt did not respond to repeated requests for comment on the decision on Tuesday, and several members of the Government Department involved in the review declined to comment. Jeff Neal, a Faculty of Arts and Sciences spokesperson, also declined to comment. “We cannot comment on the grounds for this decision, which under Harvard University policy about personnel matters remain strictly confidential,” the senior Government Department member told The Crimson. The senior professor would not specify when the promotion review occurred, though traditionally assistant professors are put up for promotion in the fourth or fifth year of their appointment. If they gain the support of their department and of the FAS-wide Committee on Appointments and Promotions, assistant professors are then promoted to associate professors and continue on the tenure track. Platt is entering his sixth year as an assistant professor, meaning that if the traditional timing for tenure decisions adhered in his case, he would have been up for promotion review during either the 2011-2012 or 2012-2013 academic year. Platt and his spring 2012 offering of Government 1310 were launched into the national spotlight at the end of August 2012, when Harvard took the unusual step of publicly announcing its investigation into an incident of widespread cheating that Dean of Undergraduate Education Jay M. Harris called “unprecedented in anyone’s living memory.” Students were accused of inappropriately collaborating or copying answers, but many said in media reports that teaching fellows encouraged them to work together. In the months following the announcement, nearly half of the 279 students enrolled in the course were investigated by the Administrative Board and roughly 70 were forced to temporarily withdraw from the College. While the adjudication of those cases took place behind closed doors throughout the fall semester, periodic breaches of confidentiality kept the case—and a number of undergraduate athletes under investigation—in the news. But as his course and former students came under close scrutiny and other faculty members throughout FAS modified their own courses, Platt remained quiet. He did not teach any courses as the scandal unfolded in fall 2012, and his scheduled offering of Government 1310 this past spring was cancelled. He did, however, teach an undergraduate government seminar in the spring, which enrolled just three students and was not listed among other course evaluations in the Q Guide. As the case unfolded, he repeatedly declined requests for comment or interviews with The Crimson and other news outlets. Platt arrived at Harvard in August 2008, the same month he earned a Ph.D. in political science from the University of Rochester. He wrote his dissertation on the evolution of agenda setting in the black political community after World War II. In his first semester at Harvard, he taught a small seminar in the Government Department on race and representation in Congress, a dominant thread in Platt’s research and teaching. The Arts designers say what distracted them this year. Students who took Government 1310: “Introduction to Congress” in recent years describe a course with a noted culture of collaboration, a practice that eventually led to alleged widespread cheating after the professor added a difficult short answer component to the course’s take-home exams. 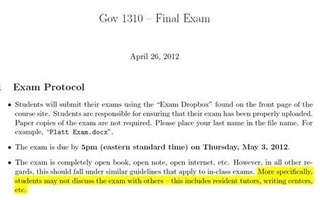 Professor of Government 1310 noted suspicious similarities between exams in his original letter to the Ad Board. Government 1310: “Introduction to Congress,” the class at the center of Harvard’s largest cheating scandal in recent memory, is no longer listed as a spring 2013 course in the course catalog.